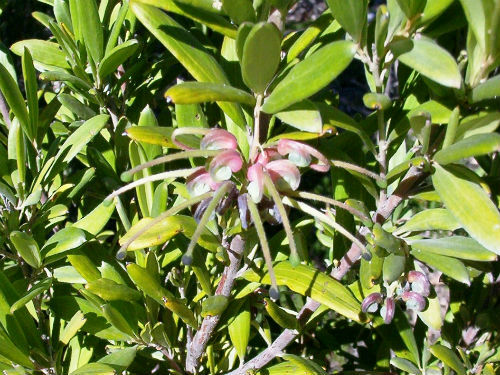 Grevillea granulifera comes in two forms. One is a rounded shrub about two metres tall. The other is a tall, upright shrub reaching a height of four metres. Both forms have elliptical leaves up to six centimetres long and one centimetre wide. Flowers are pinkish red or pinkish purple with red styles. Honeyeaters often attend the blooms. The rounded shrub form is found in Oxley Wild Rivers National Park, east of Armidale. The upright form occurs near Taree, on the North Coast of NSW. Both forms are considered rare. In the fullness of time the rounded form may be given species status. The type comes from Mt. George near Taree and was named in 1994. The species name is derived from Latin, granulus (a small grain) and ferre (to bear) and refers to the finely granular surface of the upper leaf. Both forms propagate readily from cuttings.